General Description: The Susquehanna Broad point is a medium to large size, broad, expanded stemmed point with tapered to clipped wing shoulders. Blade edges may be convex, straight or concave with asymmetry often present in larger examples, but less asymmetry than with Perkiomen points. The blades are thin for their size. Early examples often have ground bases and stem edges. The base is usually straight or slightly concave. The stems are short and contracting which terminate in expanded flaring tangs or corners. It is assumed that due to the asymmetrical nature of larger specimens, possibly caused by considerable resharpening, that they may have served as knives, while smaller, more symmetrical specimens may have been used as dart points. The size range for the Susquehanna Broad point in the 26 mm through 156 mm range with typical average length being between 38 mm and 76 mm. Some Susquehannas appear to have had their pointed shoulders removed, and these have been termed "Clipped Wing Susquehannas". This point type represents an intrusive culture that made its way into New England and is thought to have originated in the Susquehanna River valley of eastern Pennsylvania. In Pennsylvania, the preferred lithic materials were jasper, dark rhyolite, Onondaga gray and black flints or cherts, Flintridge flints and occasionally quartzite. Some specimens have been found associated with steatitie bowl sherds. 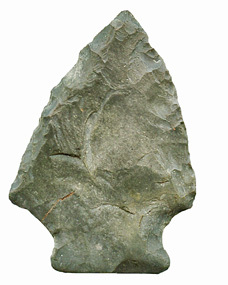 The form and age of the Susquehanna indicate a relationship with the Ashtabula point type. The Susquehanna Broad point was named by John Witthoft in 1953 for the Susquehanna River Valley in eastern Pennsylvania.